This pagoda is along the road into the center of town from the Okunoin cemetery. Pagodas are called tō. Pagodas were originally reliquaries containing ashes of the Buddha, based on the Indian stupa or hemispherical dome tomb. Now you might see Tō-ji used to refer to a pagoda that functions as a Buddhist temple (or -ji), as this one does. The sōrin is the vertical shaft extending out the top of a pagoda. 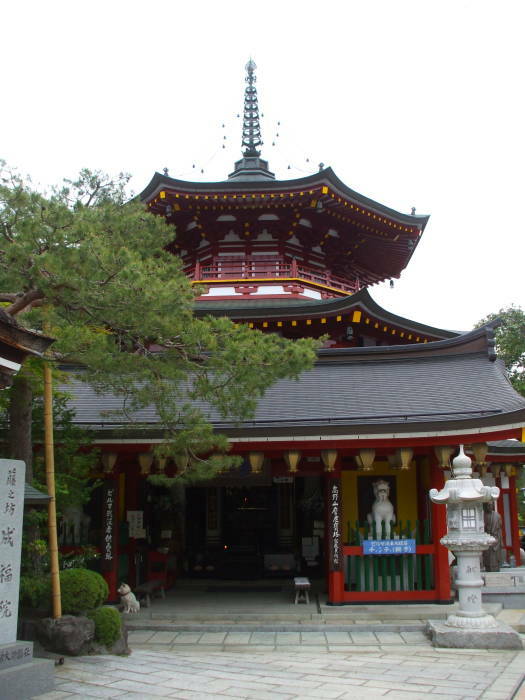 A pagoda and its sōrin is a Buddhist structure, but in Japan Buddhist temples and Shintō shrines are frequently blends of the two traditions. The wood and bronze version, as seen here, is specifically a tahōtō. Its base represents a circle of lotus petals, typically eight. This is why Kōya-san's high valley surrounded by eight peaks is especially auspicious. The Tokugawa Mausoleum was built in 1643 by Tokugawa Iemisu to honor his grandfather Tokugawa Ieyasu and his father Tokugawa Hidetada. Or, in Shintō terminology, to enshrine their spirits. These were the first three leaders of the Tokugawa Shōgunate that ruled Japan through the Edo period of 1603 to 1868. I don't think that Mark Twain ever visited Japan, but I think he would have found the multiple Tokugawa mausolea and shrines as confusing as all the heads of John the Baptist he saw in Europe and the Holy Land in The Innocents Abroad and A Tramp Abroad. These are empty, the first two Tokugawa Shōguns are buried at Nikkō. As for Shintō shrines dedicated to the Tokugawas, there is an entire category of Tōshō-gū. That's a Shintō shrine in which Tokugawa Ieyasu is enshrined under the name Tōshō Daigonngen. During the Edo period the number of Tōshō-gū grew to 500. 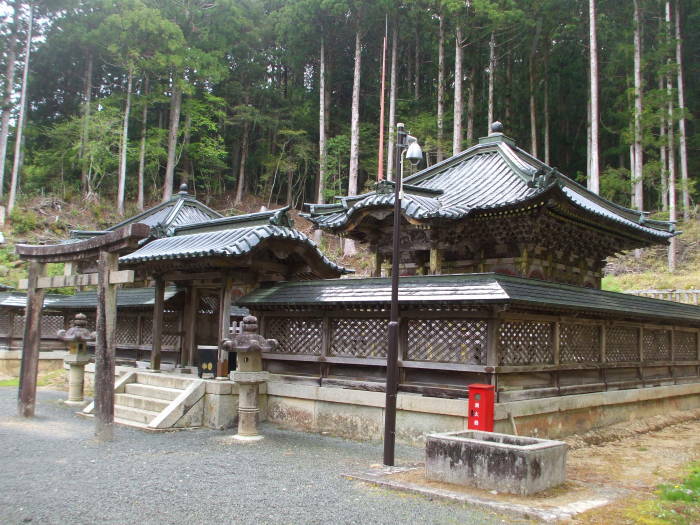 After the Meiji Restoration, some were abandoned and others were merged with other local shrines. There are still about 130 Tōshō-gū. These identical buildings are built in the hogyo-zukuri style, a square building with a pyramidal roof. Each is surrounded by a veranda and railings, with a prayer step canopy on the front. The roofs have copper tiles, with a roban, a box-like structure, over the peak to prevent leakage. They are along the road leading to the north from the center of town toward the cable car station. The Kōgakkan University near Ise Shrine and Tōkyō's Kokugakuin University are the only places authorized to train Shintō priests. 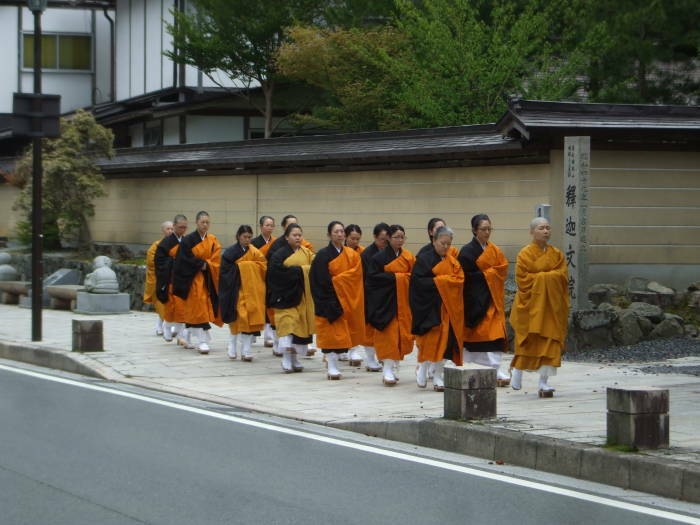 Kōya-san is home to a university where Shingon Buddhist priests are trained, similarly limited to that one location. Jukai is a formal and ancient Buddhist ceremony for receiving the Buddhist lay precepts. 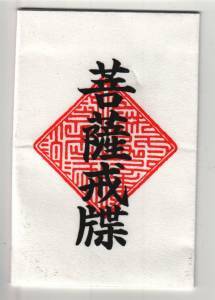 The Ten Wholesome Precepts or the Ten Guides to Wholesome Conduct are called Jūzen-kai in Japanese. There are three precepts of body, four precepts of speech, and three precepts of mind. They're pretty much the Ten Commandments plus vegetarianism and minus Yahweh. You can attend a Jukai ceremony at Kōya-san, at Kōyasan Daishi Kyōkai. I will not kill or harm any living things. I will not take what is not given. I will not have improper sexual relations. I will not speak falsely. I will not speak carelessly. I will not speak abusively. I will not speak to cause discord. I will not have thoughts of greed. I will not have thoughts of ill-will. I will not hold false views.